As in 2017, I picked a higher-level programming-language compared to C or C++ to tackle the problem this time: Go. I am quite new to this language, but it turned out to be simple enough to pick up, thanks to the Go Tour, and start building programs. 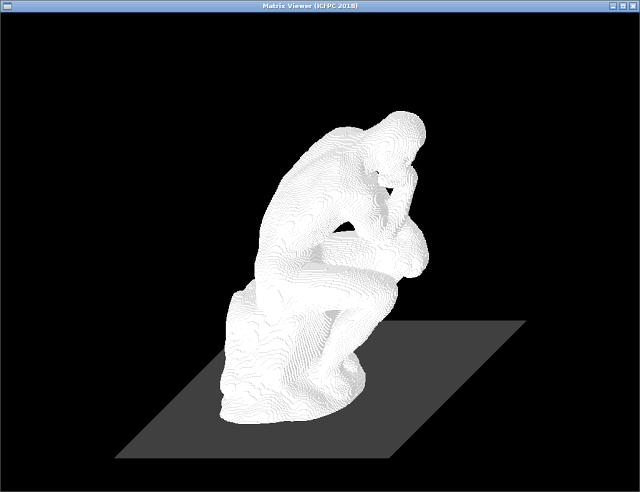 I built a viewer for the models using the go-sdl2 package, which turned out to have a straightforward API. As for the task itself, I did not progress beyond creating the model-viewer and an execution-tracer. As has become a depressing pattern during each such ICFPC attempt, I spend far more time creating a visualizer for the problem than creating a solution for it. I need to find a way to break out of this bad habit of active procrastination. The source-code for my attempt this year can be found on Bitbucket, on GitHub, and on GitLab. You can find some other write-ups on /r/icfpcontest.